LAMBPRO supplies Australia’s leading terminal and maternal genetics, a system for our clients to value add progeny, and a 100% commitment to the performance of our genetics in the Australian lamb industry. It’s this combination that puts our ram clients at the cutting edge of lamb production and profitability. The focus since foundation has always been performance based and large contemporaries run under commercial conditions. The breeding flock is run at Holbrook at stocking rates higher than the district average. This approach allows sheep with weak constitutions to be culled and performance data to be collected in commercial conditions. The seedstock flock is now over 4500 performance-tested ewes. 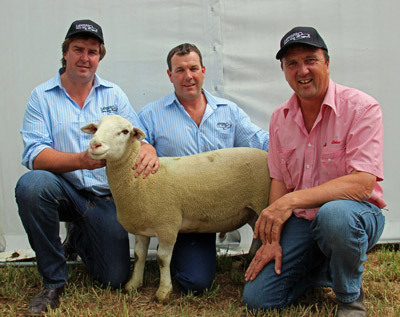 AUSTRALIAN LAMB – INDUSTRY ON THE MOVE The lamb industry is one of Australian agricultures big success stories. From a by-product of the Australian wool industry to a major agribusiness, lamb is a product on the move. Like all meat industries the challenge for lamb to remain viable is to balance the needs of the consumer with the profit drivers of all sectors of the industry. This is the only path forward if lamb is going to increase market share as a protein worldwide. To achieve this goal we need to understand the needs of the consumer and the efficiency drivers of all sectors. Nearly all of these efficiency drivers are heavily influenced by genetics. Most other industries have made significant gains through advancement in genetics for production and carcase traits, by understanding the impact genes have on different sectors of the supply chain. These have translated into significant gains for competing industries often at the expense of beef and lamb. LAMBPRO genetics and marketing systems are designed to promote maximum efficiency for producers and maximum value for processors and feedlotters who purchase LAMBPRO progeny.